We believe that Little Dolphins is the most competitively priced, friendly, family-run classes held throughout Gloucestershire and Worcestershire. Have a look at our testimonials page to see what other parents think. 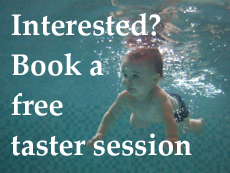 From September 2018 our price for Infant submersion classes is £108 per child per 10 week term with a discount if you swim siblings and After school classes are £99 per term. This price INCLUDES lovely underwater photos of your child at the end of every term and also certificates and badges, so that you and your little one can celebrate your childs swimming achievements learnt through Little Dolphins classes. Franche Primary School (Monday only) will have two weeks off for half term wb 18th and 25th February. Finish w/b 1st April. KINGS HAWFORD have two weeks off. No swimming wb 29th October and 5th November. The course will finish wb 26th November. WYRE FOREST LEISURE CENTRE are not swimming Thursday 11th October. The course will finish Thursday 22nd November. MALVERN AND REDDITCH are not swimming Monday 15th October. The course will finish Monday 26th November. FRANCHE PRIMARY SCHOOL are not swimming Saturday 27th October. Swimming will be on Saturday 3rd November.